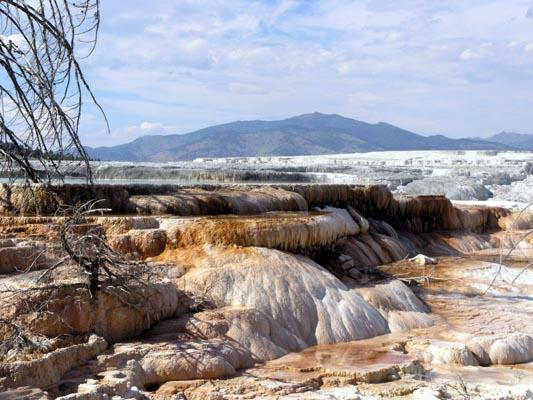 Our third trip into the park was to drive into Mammoth Hot Springs (http://www.nps.gov/yell/tours/mammoth/) and drive through to Tower-Roosevelt and on to Lamar Valley. 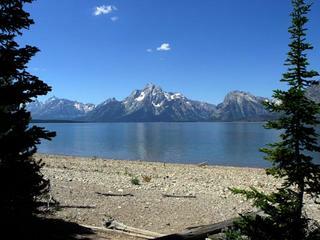 You can google for both Roosevelt at Yellowstone and Lamar Valley and find all kinds of information on both. We drove all the way out to the southeast entrance, turned around and came back. 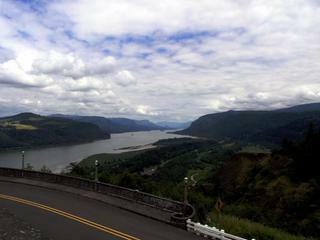 It was a beautiful drive the whole way, but we didn’t stop to take pictures much. Driving through Lamar Valley, we saw a few Bison, but that’s about it. Lamar Valley is home to one of Yellowstone’s largest wolf packs and you can sometime s see them there. No such luck for us, but maybe it’s because we weren’t willing to get up at dawn and sit for hours and hours and hours, waiting to see if they decided to show up. 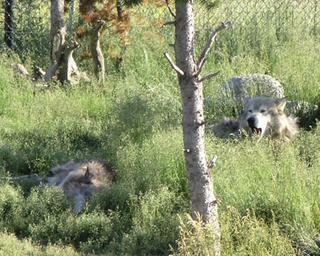 Sitting all day in 90-100 degree weather waiting in the blazing sun for the wolves to not show up just wasn’t our thing. 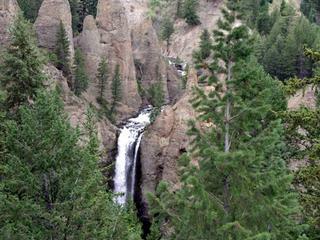 So, we drove on and stopped at Tower Falls on the way back. We took some of Tower Falls and walked a trail that leads 1mile straight down…and of course…straight back up. It was a bit more strenuous than I had thought it would be. The view at the bottom was ok, you couldn’t see the falls from the trail, but you could see the river and that was pretty, it would have been better if you could see the falls. After the falls we drove back up into Mammoth and walked the Upper Terrace trails and drove the Upper Terrace drive. It was pretty cool. A little humbling when you stop and read about why these features are the way they are and realize that you standing in the middle of a giant volcano that had erupted and collapsed, very humbling! So that was our third day, again we saw lot’s of Elk, but didn’t stop to take pictures of them, not really much on the Bison front, no Wolves or Bears. I saw some Giant white Swan, and a deer. Oh, and we saw a Coyote. Tune in next time for the last bit of Yellowstone and our INSANE trip across the country. For our second trip into t he park we decided to drive all the way through to the south entrance and down into The Grand Tetons National Park. (http://www.nps.gov/grte/) It took us about three hours of drive time through Yellowstone (at 45mph) to get to the Tetons, they were gorgeous but did n’t take nearly as long as we had planned. We planned the day to drive down, tour the park, and drive back. We drove down in three hours, spent a couple hours tooling around the park, saw everything we wanted to see and headed back. 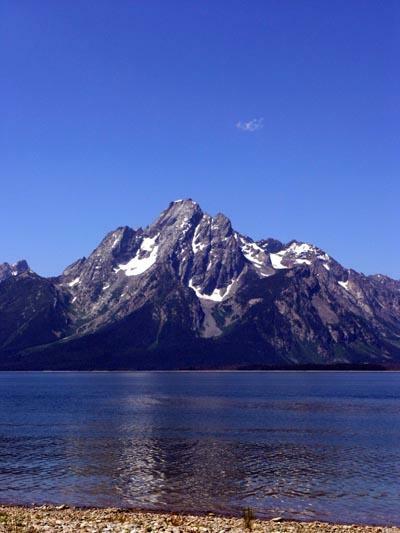 I was really surprised at how quickly we got through the park and saw what we wanted to see…which were the Tetons. The view of the mountains from the lake edge was awe-inspiring. We got there at just the right time, after taking our pictures about a dozen boats, motorized and not, hit the lake and ruined the scenery. We walked a 3-mile loop around the lake to get some good pics. The whole time along trail we saw bear fur from the bears shedding their winter coats, but didn’t see any bear. The newspaper they give you warns about it being bear country and what to do if you run into one, we didn’t need to worry about it as all the bears were hiding from us. I’m not too sad about that seeing as though there really wasn’t anywhere to go (along the trail) if we did run into one. On our drive back, since we had lots of time, we stopped at several of the features in Yellowstone that we hadn’t gotten to the day before. 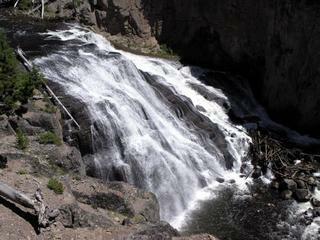 This is when we hit Sapphire Pool, and the Biscuit Basin….not the day before like I had thought. 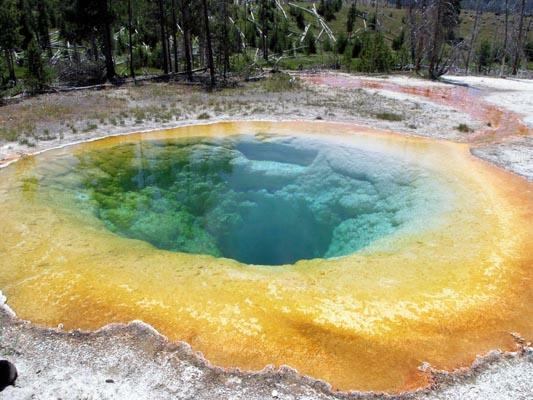 Sapphire Pool is my favorite pool, if not my favorite feature of Yellowstone Park. It’s so beautiful and the water is so pure it only absorbs the color blue, and the shades of blue it creates….there aren’t words for it. The picture doesn’t really do it justice, you can see so far down and watch bubbles coming up that seem to take forever to get to the surface because they start from so far below. Another favorite feature of mine is the bubbling mud. 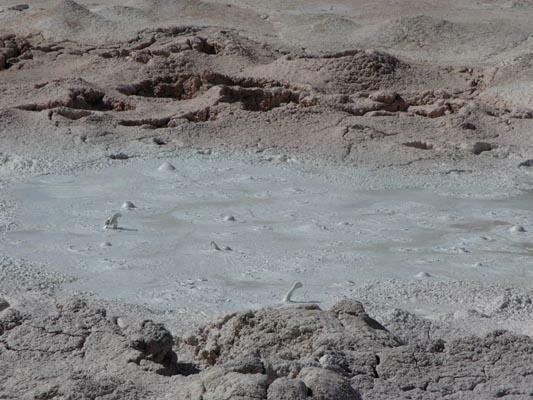 This is one pic of the bubbling mud from one of the Basins (can’t remember which one). There will be more bubbling mud in later posts…I think. The days have all started to run together for me and I’m trying the best I can to remember clearly what happened on what day. Bill took a picture of part of Yellowstone that really captures what Yellowstone looks like at every bend in the road. What a beautiful place! 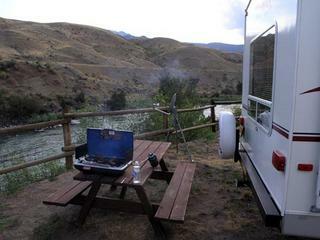 He also took a picture of the view from the back of our RV when we were staying at Yellowstone RV in Gardiner, MT. Notice the Brats cooking on the camp stove...mmm....brats! Well, I think that mostly wraps up our day trip to the Tetons and some more of Yellowstone. Hopefully I’ll be caught up soon. Here we go….catching up. 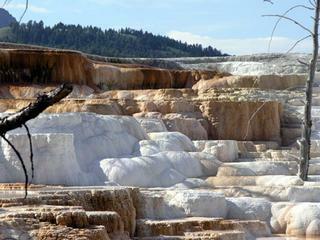 Our first day trip into Yellowstone was of course beautiful. It was different for us this year. Bill and I decided that last year when we went with the guys, that was our year to be there, it was new and incredible, with Bison and wildlife everywhere. This year was still amazing, but it had a different feel to it and the wildlife was hiding a bit. We saw a lot of Elk, but the Bison were hiding a little bit, except for the one that almost rammed the truck, but that’s another story for another day. 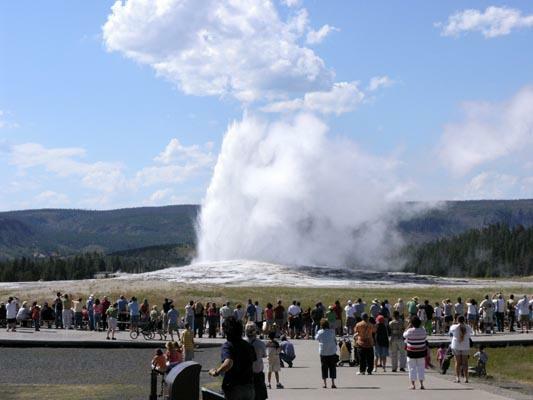 The first trip through the park took us to Old Faithful and the Upper Geyser Basin. Old Faithful was as it always is, it’s the thing that brings people to Yellowstone, but once you’ve seen all the other features, it seems a bit uneventful. Bill and I walked the trail through the Upper Geyser Basin and saw so many incredible features. We hit the trail at exactly the right time and saw a lot of the geysers going off that only go off every few days, or once a day. We had no idea what time these went off, we were just lucky. 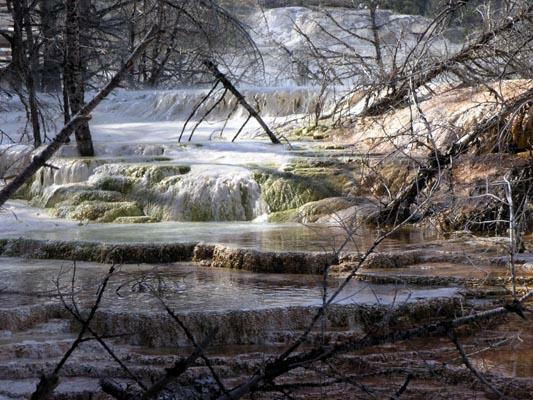 At the end of the Upper Geyser Basin trail before it gets into another trail is Morning Glory Pool , this is one of the pools that you see in post cards. The pools are beautiful, and to see them in a picture is not the same as being there. 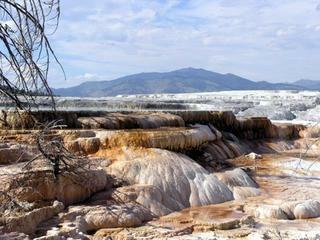 The steam coming off the pools is hot and choking and smells of sulfur. 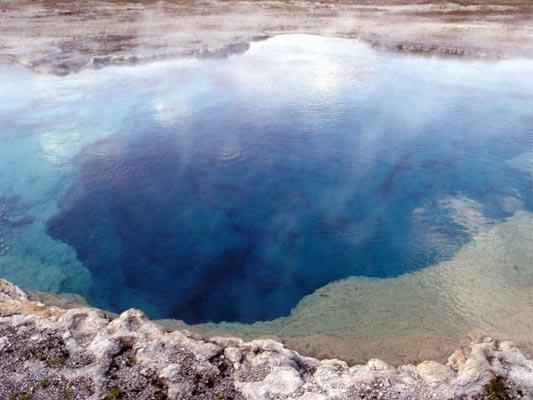 The water in a lot of the pools is hot enough to boil the skin off your bones. It really is a humbling experience, and amazing to see animal tracks in the areas that look like another planet that is inhospitable to life, and yet life abounds. Set amid the green of the mountains and the blue of the rivers and lakes, are boiling cauldrons of volcanic activity. Yellowstone doesn’t just hold the worlds most volcanic activity and geothermal features in one place in the entire world, it also has some beautiful waterfalls. Gibbon Falls is only one example of the falls in Yellowstone, in another post I’ll show pics of the upper and lower falls in the Grand Canyon of the Yellowstone, but that was another day, so it will be another post. After exploring the geyser basins we drove out to West Yellowstone to visit the Grizzly and Wolf Discovery Village to see the wolves. This first day to the wolves was a bit uneventful, we got there during a hot part of the day and the wolves were all lazy bones in the shade. It was nice to see them and to know that they are still doing well. That concludes the first day in Yellowstone National Park, stay tuned for the next installment that will be coming the next time I have time to write it. PS – We are currently in Pennsylvania…I have a TON of catching up to do. We left Portland at 8am on July 15th. The night of the 14th was a teary (for me anyway) goodbye to the guys. We had a nice day/night spent with them. I never thought I’d experience separation anxiety, but there I was, giving them hugs and not wanting to let go. Ok, enough of that, or I’ll cry again….geez…I’m getting soft in my old age. It’s now July 27th and we are in Pennsylvania and it’s been such a wild ride that I’ll have to split this up into several posts to cover everything between my last post and now. Originally the plan was to stay in Coeur d’Alene for a couple of overnights before heading to Montana. Last year when we went to Yellowstone we drove through Coeur d’Alene and I couldn’t believe how beautiful it was, so we planned to stay for a bit. 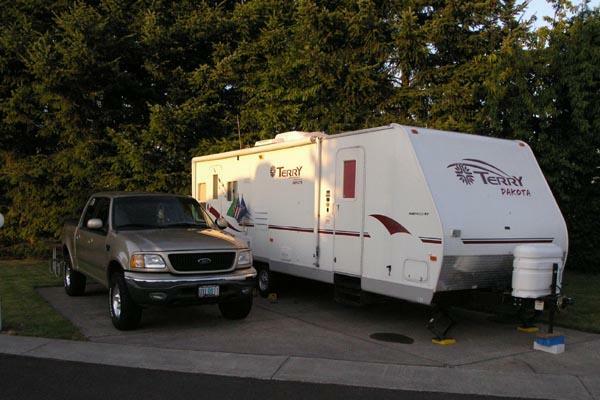 We got to the RV Park and were really disappointed. The park wasn’t what we thought it was going to be, there was a mill directly across the river that wasn’t on their website that was an eye-sore and noisy. We were on a river, but not the lake and it just wasn’t what I thought it would be. Frustration at all that was compounded by not being able to get our dish to work…come to find out we probably have a broken receiver and they have to send out a tech…while we are on the road….. The park was really nice about refunding all but one night of our stay (because we set up and had been there all afternoon, and it’s peak season, they had to charge us for a night), so we packed up and hit the road again at about 8-8:30pm and drove on. Of course, as we left we drove through the part that I remember being amazed at last year. The plus is we saw some campground/RV places on the way out that we may be able to stay at in a year or so when we are back on this side of the country. The drive through Northern Idaho just at sunset was really nice, and then it was pitch black. I tried to stay awake for most of it, but ended up dozing off once we hit Montana and dozed on and off between the cities and gas stops. I was asleep when we hit Missoula and Bill said that I missed about an hour of the most amazing lightening show I’ve ever seen. Once I woke up and I stayed awake to see it. It was really pretty. There was no thunder that I could hear to accompany it; there were just flashes and streaks about every 15-30 seconds. We arrived in Bozeman about 4:30 in the morning (mountain time) and parked in a Wal-Mart parking lot and hit the sack, slept until about 10am, got up…brushed our teeth, waddled into Wal-Mart for donuts and juice, and hit the road again. 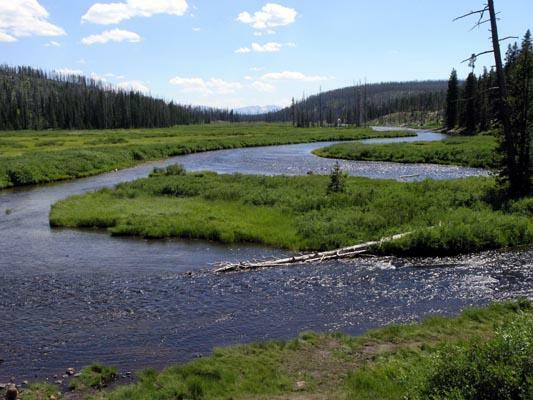 In Bozeman I called the p lace we were supposed to be on Monday and they didn’t have room for us early, so we called some other places and found a spot at Yellowstone’s Edge RV…what a beautiful place. 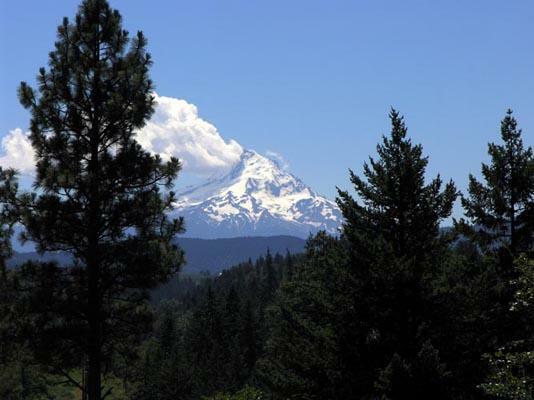 This was the view from our RV in the park, and they had an all you can eat, ice cream social on Sunday night….bonus!! The ice cream was SO good. I had Montana Moose Moss, Stuck in a Rut, and Huckleberry…mmmm…mmmm…..good! 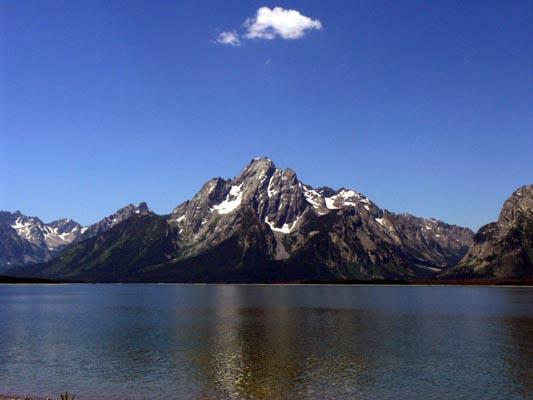 Catch the next post for our week in Gardiner, MT and Yellowstone National Park. Whoo, ok, so I have some catching up to do. The last week that we were in Portland, I typed up a nice post about the two gardens that we went to, and my computer ate it. Figures! Anyway, this is now going to be the catch up post and not nearly as cool as the other one, I’m sure. The first garden we visited while still in Portland was The Grotto (http://www.thegrotto.org/); it was really a nice place. They have it split into two levels that are separated by a 110-foot cliff that you have to take an elevator to get to the top garden. For those who don’t know me, I hate elevators. The elevator was creaky and squeaky and mostly made me dig my fingernails into my hands. But I survived and was rewarded by beautiful scenery and statuary. We didn’t take an abundance of pictures at The Grotto; it just seemed more a place for quiet contemplation than for tourists with cameras. The second garden we visited was The Classical Chinese Garden (http://www.portlandchinesegarden.org/home), which was also amazing. They are really particular about pictures being taken and what’s done with those images as is stated on the back of the entrance ticket: “The Portland Classical Chinese Garden retains the copyright to all photos, drawings, paintings, artwork, etc. made of the Garden or objects therein. Works of the Garden may be made for personal use, but the Garden must approve any commercial use in advance, in writing. So for my personal use I’m posting a couple of images here that are not for commercial use! And that concludes the catch-up of the gardens. 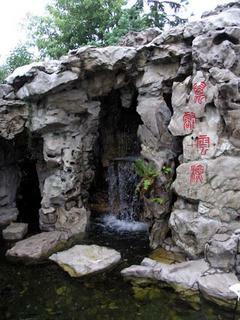 The waterfall at the Chinese Gargen was really nice. The rock used was all shipped in from Suzhou, China and the surrounding areas. The Gardens are never the same twice as different plants and trees are blooming at different times of the year. We also had time in our last week to get back to Multnomah Falls (see previous post for web links) and take some pictures of the area. I’m not going to write a lot about these falls, but here are some pictures. 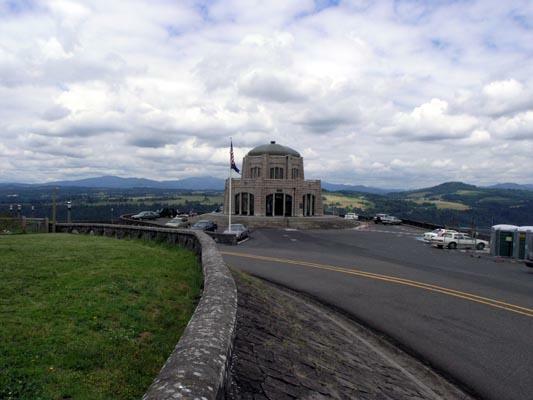 Vista House and the view at Crown Point. The day we went was a bit cloudy and a little hazy, so the pictures don’t show just how breath taking the Columbia Gorge can be. (http://www.vistahouse.com/). 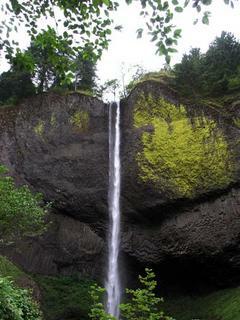 The following pictures in order show, Latourell Falls, Wahkeena Falls, Multnomah Falls (with the bridge), and Horsetail Falls. 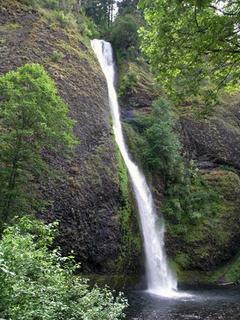 These aren’t all the falls, only the ones that are viewable from the road of the Historic Columbia River Highway. These are the falls that you can view as you drive by and pull off and take pictures of, there are others that you can see if you hike the trails, which we didn’t have time for. 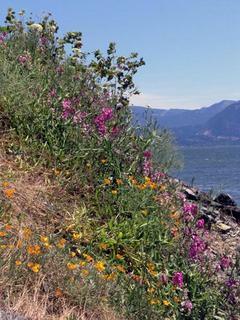 So there it is, the catch-up post for the Gardens and the Falls, the last week of Portland. 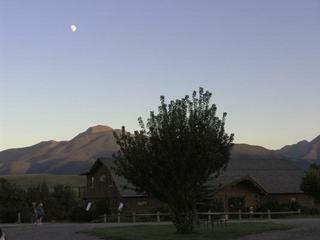 We are currently in Montana…two days early….but that will be another post. Getting ready to Hit the Road!! The first few days of living fulltime was spent getting the trailer (30' Terry Dakota 830Y) settled and going through to make sure everything was put where it needed to be. We had a couple of small hitches to get through in the first week or so. One, we got food poisoning, not fun. I won't comment much on that except to say that we never want to experience that again, and it's a damn good thing we didn't both need the bathroom at the same time. Consequently we are both feeling much better, thank you! Two, our first grocery shopping trip for just us, without having to buy for the guys, was just...well...weird. Buying one package of two little steaks instead of buying 20lbs of the biggest steaks we could find, was a bizarre experience. Also having to think about consuming everything before it goes bad, the fact that food lasts long enough to go bad....strange! 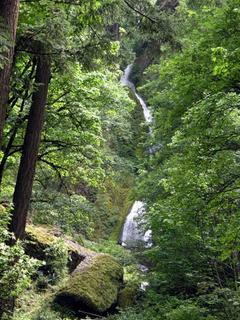 Bill and I have been trying to get out and see some of the things that people always talk about when visiting Oregon. We drove the Mt. Hood Scenic Route which was nice and had some wonderful views of the mountain at 40 mph. We did catch one spot that had a nice view of Mt. Hood (above), one....one....on a 4 hour drive! Neither of us understands why you would have a Scenic Route and not have pull offs at the most scenic parts. But it was a beautiful day and we enjoyed ourselves. ( http://www.mthoodterritory.com/byway.htm) It was really pretty to stand at Mt. Hood lodge and look out with Mt. Hood to our backs and see Mt. Jefferson in the distance with the Three Sister just to the left (below). 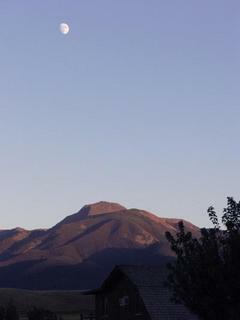 You can't really see Three Sisters in this pic, but you'll have to trust me. 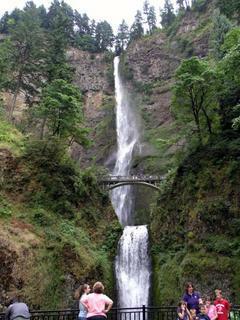 Another day we went to Multnomah Falls but didn't have the camera with us since we both forgot to charge the batteries. For some reason the blog won't let me put the URL to the falls in here without messing up where the pictures are...so you'll have to Google for Multnomah Falls, there are some great sites with nices pics of the Falls that you can see. Every day that goes by, the more excited we get to hit the road. It's been a little odd getting used to having so much time. Bill asked me today what it was we used to do that took up so much time, because he can't understand why we now have so much of it. We've also been to The Grotto and The Chinese Gardens, but I will put that in another post either tonight or in the next day or so.